A beautiful young woman is found murdered on a river bank, and Detective Harriet Blue is convinced she's the next victim of the worst serial killer Sydney has seen in decades. But the more Harriet learns, the more she realises this murder is not what she first thought. And her own life might be tangled up in the case. 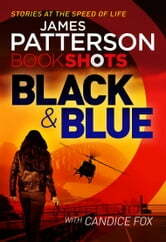 James Patterson is one of today's greatest thriller writers in my opinion and this book doesn't let you down. Cliffhanger ending! This was a really enjoyable read and a really good prequel to Never Never. Most enjoyable with a great cast of characters.